Short hikes are a great way to still see the beauty of the Smoky Mountains, even if you don't have much time, or energy. For classification purposes, all of the hikes included on this page are 4 miles long or less. Metcalf Bottoms/Little Brier Gap There are lots of neat historical sites to see on these trails. You'll see a schoolhouse on Metcalf Bottoms and a cabin on Little Brier Gap. These trails are between the Townsend entrance and Elkmont. The total hike length is 3.6 miles. It's also a great family hike. Grotto Falls What's so neat about this waterfall is you can walk behind it. Grotto Falls is on Trillium Gap Trail, off Roaring Fork Motor Nature Trail. It's near the Gatlinburg entrance and the hike is a total of 2.6 miles to the falls. 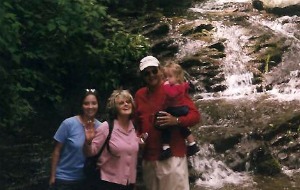 This is another great family hike. Chimney Tops If you're looking for an adrenaline rush, this hike's for you. Although it's a steep climb, the amazing views at the end are worth it. This is probably my favorite short hike although it can be quite crowded. So, here's a tip, go early on a weekday. Maybe you'll have the views all to yourself, at least for a little while. :) If you start from Newfound Gap, it's a 4-mile hike. The other option is to start from the less popular, least-crowded end on Clingmans Dome Road. That makes for a 7-mile hike. Don't let the steepness deter you, the views are incredible! Andrews Bald This hike has views, wildflowers, and the destination is a great place for a picnic. It's a 3.6 mile hike located off Clingmans Dome Road. Schoolhouse Gap This trail is actually a wide, gravel road. A stream runs along it and there are lots of wildflowers to see. It's located near the Townsend entrance and is 2.1 miles one-way. Remember you can always stop whenever you want and turn back for a shorter hike. This is a good family hike. Deep Creek Waterfalls Loop This 2.4-mile loop hike gives you the chance to see all 3 waterfalls in the Deep Creek area. This easy hike also gives you the chance to enjoy hiking along Deep Creek.